What is Alpha and Beta Hemolysis-Difference between alpha and beta hemolysis. Alpha and beta hemolysis and difference between alpha and beta hemolysis. Alpha hemolytic bacteria cause incomplete lysis of red blood cells. greenish zone around their colonies on the blood agar. 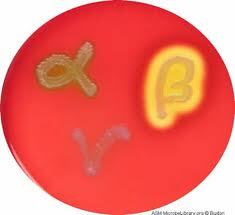 Beta hemolytic bacteria cause complete lysis of red blood cells, hence they form clear zone around their colonies. Some bacteria (e.g S. pyogenes, S. Aglactiae ) produce enzymes called Streptolysins ( also called hemolysins). These enzymes are responsible for breakdown of RBCs. Those bacteria which produce these enzymes show beta hemolysis and those which don't produce these enzymes show alpha or no hemolysis.